The Historic City of Dublin is part of the Tentative list of Ireland in order to qualify for inclusion in the World Heritage List. I visited Dublin a couple of times, most recently in 2017, and set aside some time for exploring, but the reality is that there is little to explore there that rises to the level of exceptional. The town is undoubtedly nice, the people are among the friendliest in all of Europe, but beyond a few eye-pleasing clusters in the city center, most of the Georgian architecture that forms the basis of this tentative WH submission is actually kind of boring (I am noting the fact that the text of the submission openly warns the reader of the plainness of the exteriors and contrasts that with purportedly excellent interiors, which can hardly be seen on a short visit to town). You may be impressed by the campus of the Trinity College (stop by to see the Book of Kells in the college library). You will likely be pleasantly surprised to discover the Dublin Castle and Gardens, effectively hidden smack in the middle of the city. You will certainly walk over the Ha'penny Bridge over the river Liffey. 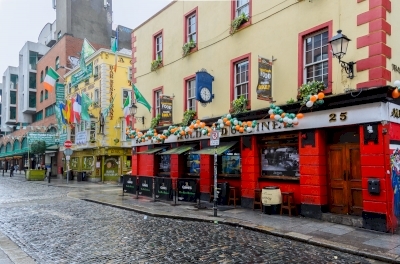 And regardless of your attitude towards beer, you will likely linger on the streets - or in the establishments - of the Temple Bar district, the most colorful and at times boisterous part of town. Beyond that, there is little that can be pointed as a must-see in Dublin. Curiously enough, the justification portion of the tentative submission emphasizes the literary traditions of the city. You will most certainly come across a fair share of monuments to famous Irish writers in Dublin's center, such as the irreverent Oscar Wilde's memorial in a corner of St Stephen's Green. There are a few museums and other points of interest in the city that are not related to its tentative WH status, but can make a couple of days of a visit pretty engaging (National Gallery of Ireland, Jameson and Teeling distilleries, Guiness Storehouse), but on balance it is hard to see how Dublin may merit the full WH recognition. I wasn't trying to visit Dublin, but fate intervened. I had a layover, which was diverted to Shannon. Unfortunately, this made us miss our cross-Atlantic flight! Therefore, I had the better part of a day in Ireland with my 24 hour visa. We got to enjoy a splendidly different environment from our primary destinations. We used the double-decker buses to access the historic centre and walked much of the city. Not only did we have a wonderful time, Dublin turned out to be a perfect end to our latest trip to Europe. Some quick research guided my walk. 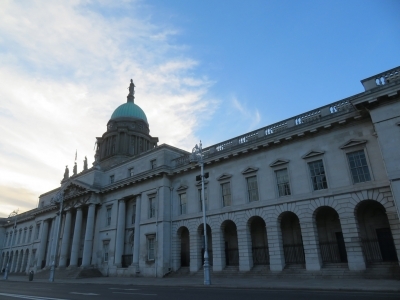 The Custom House (1791) has a pleasant location on the River Liffey. Dublin's "extraordinary contribution to world literature" is highlighted throughout the city in statues or plaques that dot the cityscape. Georgian architecture is interspersed throughout the city, but particularly abundant near the river. I found Trinity College to be particularly interesting, one for its architecture, but also for its historic importance as one of the major universities of Europe. The alumni mentioned in the UNESCO description who made such notable contributions to world literature are represented primarily in statues and intangible meaning rather than the University that produced them? It is perhaps surprising such a major component of Dublin's historic centre is not mentioned in the nomination. As much as I enjoyed Dublin, I really don't think that it deserves to be listed in the WH list. To much urbanisation although interesting to visit!